The new Boden catalog arrived in the mail yesterday. Needless to say, now I'm dreaming of spring. (If you don't get their catalogs, you are missing out! go here). Oh, spring! I am so ready for it. I love that yellow top. they have some really cute things, cant wait for the weather to get beter! I am LOVING those moccasins in the green color! And the red! Maybe I need both colors. Also, they have jersey scarves at Old Navy just like those for $5. everything is so cute and happy! yay for spring-a-coming! gosh this makes my hear go pitter patter! ooh i'm just itching for this snow to melt. cannot wait for spring to get here! Ahh, love those mocassins! Remember the days we wore cute little pumps, before our wellies were welded to our feet and we had to trek through snow and blizzards and sludge for months on end?! Bring on the Spring I say! I totally agree! The catalog had me dreaming of daffodils and sunshine! I ear marked the moccasins as well! And then mini boden arrived yesterday. Toddler sun hats, oh my! HOw pretty and fresh! Oh i browse so many US blogs and so many things I see that I love is not avaible over here :( At least the Antropolgy store has got on line! That is a thing to celebrate!!! They have such great quality clothing. They do an amazing job! Are you going to get any pieces from their Spring collection? I'm thinking I need to bend my "no catalog" rule for this one. I want everything you featured! i just got the catalogs. have only looked at the kids so far. everything is always such great quality. the peppermint stripe scarf is so cute! plus that tote. adorable. I love Boden, in fact I think I may just have mentioned that before to you! Those shoes are absolute top of my Spring wishlist from this seasons catalogue. AH, I love those mocassins! And that bag! my mom always got Boden and i overlooked it until a few years ago - so cute! i'm dreaming of spring too. Great pieces! 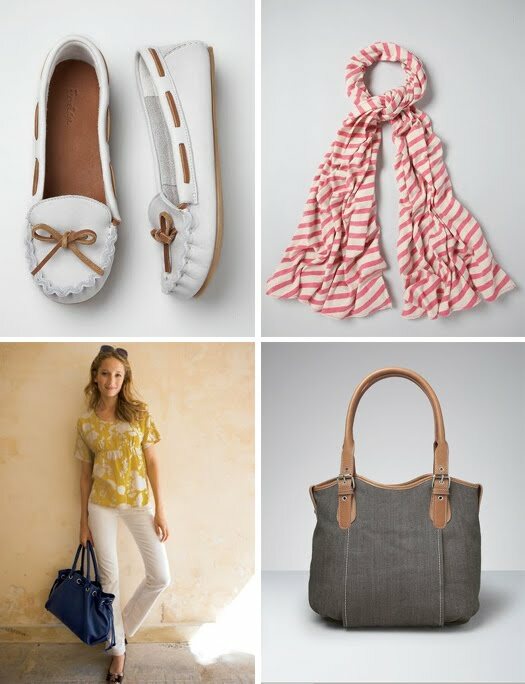 I love the nautical look. i so wish i could pull of the skinny white jeans but they just aren't flattering on me. love that pretty scarf!